Review date: 31 January 2003. 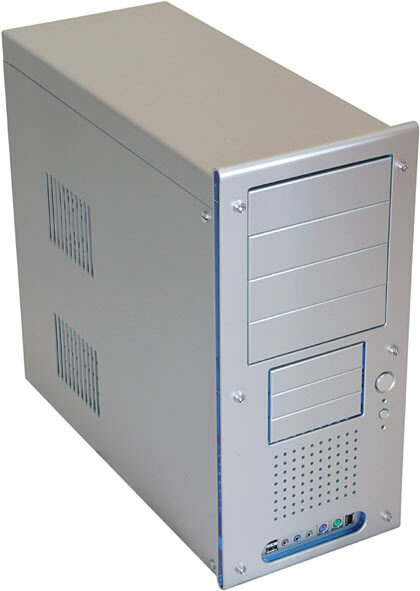 Aluminium PC cases used to be exotic, but these days there are tons of them on the market. Most of the world's computers are still in steel cases, of course; steel's much cheaper than aluminium, and aluminium doesn't actually have any major advantages beyond the cosmetic, if you don't want to build the lightest possible PC, or care a lot more than usual about corrosion. 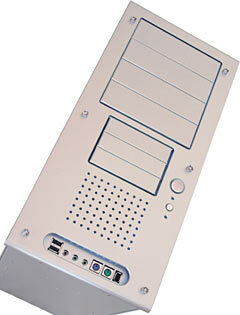 But plenty of companies are now making enclosures out of aluminium, with varying degrees of success. Lian Li were the pioneers in the funky-aluminium-case field, and they continue to pump out new models and variants on old ones. But they're far from the only horse in the race these days. FastWin have taken a few shots at the zooty-case market; I recently checked out their good-but-not-great FW-168A case, here. Now, Aus PC Market here in Australia are also selling the FastWin FW-810S, which aims higher. And aims better, too. The FW-810S is not a cheap case. It costs $AU451 from Aus PC Market, including Sydney metropolitan delivery (delivery elsewhere in Australia is more expensive). You'll only pay $AU275 for a Lian Li PC-60USB (I review different PC-60 variants here and here), which isn't at all new but is still an excellent product. The real price difference between the two is quite small, though, because the FastWin case comes with a Power Supply Unit (PSU). The PC-60USB price is sans PSU. A half-decent "350 watt" PSU - and this seems likely to be one, as I'll explain in a moment - is about a $AU140 item. Take that into account and suddenly the FW-810S is only a bit more expensive than the PC-60USB. The FastWin case's basic specs are quite like the Lian Li's. It's 203mm wide by 421mm high by 470mm deep (8 by 16.6 by 18.5 inches); the PC-60 is 210 by 440 by 485mm. The FastWin has fewer drive bays than current PC-60s, but it's still got more than most people need. There are four 5.25 inch drive bays (all externally accessible, of course; there aren't many 5.25 inch devices that don't need a front panel cutout), and three externally accessible 3.5 inch bays, plus another three internal. Current PC-60s have the same four-plus-three layout for their externally accessible bays, but can fit another five 3.5 inch drives in a vertical-mount cage at the bottom. 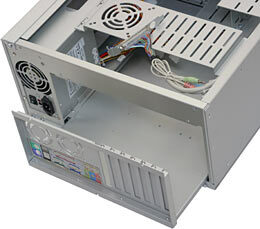 Only the bottom 3.5 inch bay cage in the FW-810S is removable, for easy drive installation, and you have to remove both side panels to get at the screws that hold it on. PC-60s make it easy to remove both 3.5 inch cages. The FW-810S's front panel looks good. Quality brushed metal finish, nice smooth edges, snazzy flush-mounted buttons (with a suitably hard-to-accidentally-press reset button), understated power and drive LEDs, and a translucent blue edge. The chunky front bezel is about 440mm high, so it sticks out both above and below the actual front of the case. This looks weird when you take the FW-810S out of its carton, because the case has no feet on the bottom; set it on the floor and it rests on the bottom of the bezel, and the back edge of the box. Fortunately, you do get feet with this case. They're self-adhesive, and come in the "bits bag" of extra stuff, about which more in a moment. ...that the bezel has three separate pieces - it's an aluminium sandwich with clear blue acrylic in the middle. Case modders who'd like to light up the acrylic, or otherwise mess around, will probably find this rather interesting. Air flow through the front fan grille in this bezel won't be as good as it is through a Lian Li bezel, because FastWin have for some reason chosen to put small intake holes in both aluminium pieces, despite the fact that you can only see the outer one. The acrylic panel has one large rectangular hole lined up with the grilles in the other two panels; the inner panel ought to look the same, if you ask me. There's no dust filter for the front fan; filters impede air flow too, but that's an acceptable price for keeping dust wombats out of your PC, if you ask me. You could, mind you, easily cut a piece of open-cell filter foam to fit in the hole in the acrylic panel. Cleaning it wouldn't be much more annoying than getting at the old-style clip-retained Lian Li filters. With the bezel removed, you can see the front fan grille, which has screw holes for 80 and 92mm fans, but no fan at all as standard. 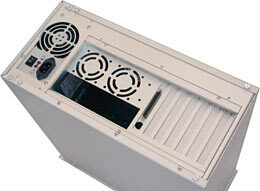 PC-60s, famously, give you two speed-controllable 80mm intake fans as standard equipment. The stamped grille will restrict air flow even more, but if you don't like it, aluminium's easy to cut. ...with a two-part cable that plugs into a monster D connector on the back. All of the loopback stuff except the audio connectors is hooked up to the D connector; the case comes with a cable that plugs into that connector and provides you with all of the plugs. The front audio connectors are separate; you pass them through the round hole next to the D connector. Or don't, if you don't want to use them. The D connector is mounted on a regular back panel slot cover, so you can put it wherever you want, or just tuck it away inside the case if you don't want to use it at all. Apart from the D connector, there are only two unusual things about the back of the FW-810S. One is the two 60mm exhaust fan mounting spots. There are (again) no fans there as standard, and two 60mm fans can't be expected to move much more air than an 80mm fan that consumes the same power. Most Lian Li cases come with an 80mm rear exhaust fan as standard equipment, and many of them also have an exhaust fan in the middle of their top panel. Current PC-60s have both. 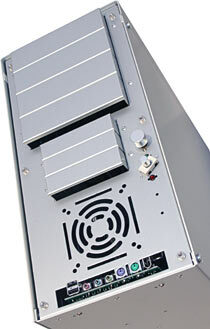 The second unusual thing about the FW-810S is the motherboard mounting tray, secured with three screws. 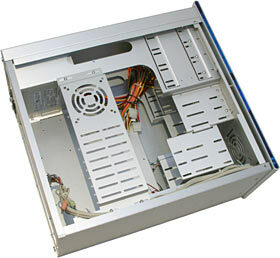 Most medium-sized cases don't have a slide-out mobo tray; many Lian Lis do. A tray's no big deal if you're not working on your computer a lot, or trying to fit in a giant haystack of components; if you are, a tray can be really handy. The standard PSU in the FW-810S is an allegedly-350-watt unit whose spec sticker, reassuringly, lists aggregate power ratings for the major rails; the 3.3 and five volt rails together are rated at 220 watts, and the three main power rails (3.3V, 5V, 12V) score 330W. The rest of the 350W total rating comes from the minor and negative rails, which never need to deliver much power. I talk more about misleading PSU ratings in my review of a few Topower products here; for some hard-core smoke testing, check out the Tom's Hardware piece here. The PSU's got five four pin "Molex" drive power plugs, two of the smaller floppy plugs, plus the usual ATX, AUX and ATX12V ("P4") plugs. This is a "silent" PSU, which means it's got a fan in it, but that fan doesn't spin very fast. This means that this case needs an extra fan or two, if you're going to build an even moderately powerful PC into it. It doesn't matter if your computer room ambient temperature is barely above freezing; the one weedy fan in the PSU just won't move enough air through the case, and the superior thermal conductivity of aluminium (compared with steel) contributes little to the equation. The left hand side of the FW-810S, as you look at it from the front, has these two prominent grilles. As you can see through them, only the top one lines up with a real fan mount (once again, with no standard fan); the other one can have a fan mounted under it, but there's more metal than gap there, so not much air would flow. 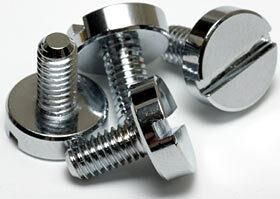 The side panels are held on with these unusual slotted-head screws. They're almost thumbscrews; you only need to use a driver to start them turning and snug them down, and can use your fingers for the rest of the unfastening/refastening process. This, plus the fact that they look good, compensates for the tendency of slot-head screwdrivers to slide out and plough a furrow across the side of your case. Slotted screws date back to when individual screws were hand-made by a bloke with a file (you try filing out a Phillips head); these days, their principal function is the encouragement of murderous rampages among woodworkers. Once you've removed the four screws, the side panel just lifts out; you don't have to slide it. 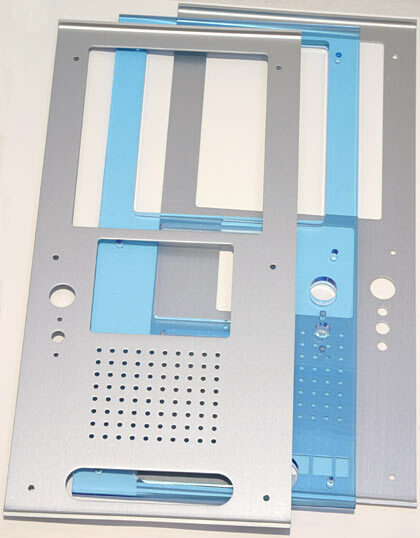 Since nobody, including Lian Li, has ever made a truly elegant slide-out side panel, I count this as a win for FastWin. 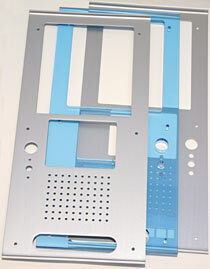 You can also remove the top panel, for easier access to the top 5.25 inch bays. The other screw-fastened parts of the FastWin case are held together with ordinary small combination head (slotted-plus-Phillips) screws. Which are fine, but which lose out to the Phillips-head thumbscrews that Lian Li use all over the place. Inside, the only big news is the fan-mount cross-piece, which lines up with the side panel grilles. The fan mount is another 80-or-92mm job; below it are slots on which you could mount another fan if you wanted, but only if you cut out some metal to let the air through. ...but the slide-out tray helps with that. If you want to get rid of the cross-piece, you can just unscrew it. Its screw holes are slots, too, so you can move it fore and aft a bit if you like. The cross-piece stiffens the FW-810S somewhat, but this case doesn't need reinforcement. It's unusually solid for an aluminium box, because it's made from unusually thick aluminium. Lian Li use 1.2mm aluminium in their cases, but they roll the edges of their panels for strength. Some cheaper aluminium cases have similarly thin metal, without rolled edges; their case sides can be employed as musical instruments. FastWin have used 2mm aluminium throughout the FW-810S, which means this case should survive being sat on by the plumpest of geeks. The thick metal's allowed FastWin to get away with not rolling any edges in the FW-810S; the side panels have nothing but a 90 degree fold at the rear end, but are still very rigid. Fortunately, the un-rolled edges are not the razor-sharp die-stamped flesh-ripping type, which you'll find in many cheap cases. You could cut yourself when working on this case if you were unlucky, but it's not going to happen all the darn time. 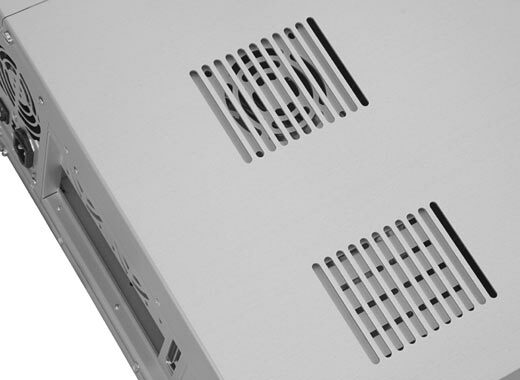 The rear slot covers in the FW-810S are aluminium (Lian Li use shiny-plated steel), which makes them rather bendy. That's not a problem for the ordinary covers - it's not as if they're structural components - but the loopback cable connector's slot-cover mount is particularly flimsy, thanks to the big hole for the audio cables. If you slide the motherboard tray out without undoing that slot cover's mounting screw, the cable will pull taut, and the slot cover will bend at the hole and pop out its bottom tab-slot while remaining fastened at the top. Ugliness will ensue. 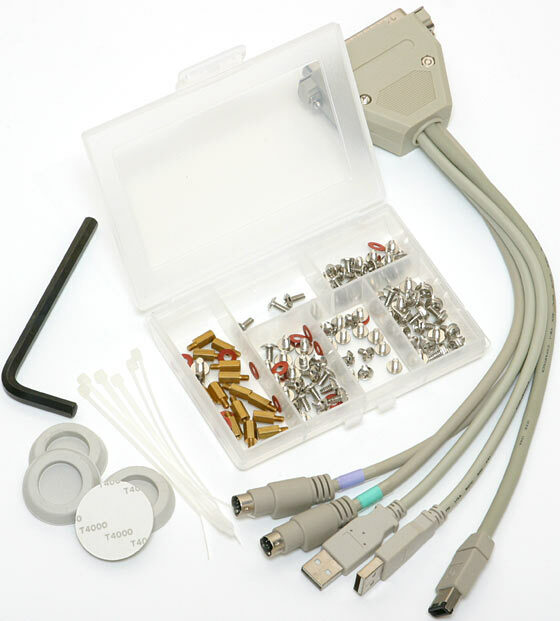 The contents of the FW-810S bits bag. Check out the little tackle box for the screws and washers and motherboard mounting standoffs. Beats the heck out of the usual baggie. The standoffs provided are of conventional design - screw-in hexagonal brass things - but they're taller than usual. This isn't a problem, unless you manage to mix one or more normal-height standoffs along with the tall ones, and then enthusiastically tighten down your motherboard mounting screws. In which case the creak of tortured fibreglass will be heard in the land. Along with the fasteners, you get several nylon zip-ties to help, or at least encourage, you to tidy up your cables, a hefty Allen key to the front panel screws, four stick-on feet, and the loopback cable for the back of the case. The FW-810S is a good looking, solidly made case with excellent fit and finish, a couple of mildly innovative features, and a fairly good price. If you want a ton of case ventilation, the FW-810S can give it to you, but only if you buy extra fans. With two rear 60mm fans, and 92mm fans in the side and front locations, it'll be well ventilated; the bottom drive bays won't be as well cooled as those in a dual-front-fans Lian Li case, but the side fan ought to balance that out. None of that stuff comes standard, though, and you must buy at least a front intake fan with this case, if you're not planning to use some other non-"silent" PSU with it. With just the standard PSU and natural convection moving air through the box, I wouldn't be surprised if this case could overheat a C3-based machine, let alone a P4 or Athlon. Fans aren't very expensive, of course, and a few bucks either way don't generally bother people who've already committed to buying an aluminium case instead of a more financially sensible steel one. Still, you don't want to pay more for a worse product. Aus PC Market sell Lian Li cases unusually cheaply, by world standards. If you're not in Australia, you'll probably find you can't get a PC-60USB as cheaply as we can here. So, at Aus PC prices, I think the PC-60USB beats the FW-810S. 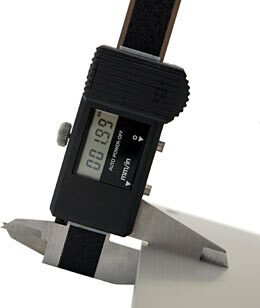 In the rest of the world, the FastWin might, um, win; it depends on what features turn your crank. Here, the Lian Li works out a bit cheaper after you factor in the price of the PSU, and it comes with four 80mm fans (two front, one back, one top, with an intake filter and speed control for the front ones), and thumbscrews throughout. The FastWin certainly doesn't lose by a mile, though; if someone pointed a gun at you and forced you to buy an FW-810S instead of a PC-60USB, you probably wouldn't be very bothered. Well, apart from the whole weird-guy-with-a-gun thing, that is. So, for Australian buyers, I give the FW-810S a qualified recommendation. It's a good case, but it's a bit too expensive; if it came with a full set of fans pre-installed for the same money, it'd be a real winner. In the rest of the world, the FW-810S (assuming you can find someone selling it, of course) should have a bit of a value edge over the PC-60USB. Aus PC Market no longer stock this case, but they've got plenty of others! I recently checked out the FastWin FW-168A, and three other cases, here.